Jeff Banal and New Ulm hopes a second straight season of drawing the top-seeded team at state leads to a better result (Photo by Helen Nelson). Last year New Ulm made the state tournament, then made ESPN's SportsCenter for all the wrong reasons. The Eagles gained nationwide notoriety as Breck scored four goals in 52 seconds in the second period of the teams' Class 1A quarterfinal matchup. The Mustangs rolled to an 11-1 victory en route to their second straight state title. “I expect a lot better,” New Ulm coach Erik Setterholm said about his team's opening performance in this year's state tournament. Unseeded New Ulm (23-4-2) again will be the heavy underdog when it opens with a 6 p.m. quarterfinal matchup against No. 1-seed and No. 1 ranked St. Thomas Academy (22-6-0) at the Xcel Energy Center in St. Paul. “We are facing the same type of same scenario,” Setterholm said. “But I'm not going to tell you I see us getting blown out like that again. New Ulm beat Section 1A runner-up New Prague and tied Prior Lake, a Class 2A program, early in the regular season. The Eagles then won a holiday tournament in Rochester with an impressive 2-0 victory over Wisconsin powerhouse Eau Claire Memorial in the championship game. 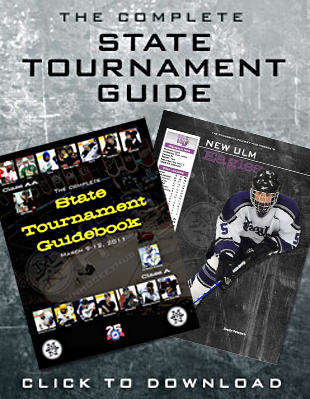 New Ulm reached the state tournament with another shutout victory, this one by a 1-0 margin over Litchfield/Dassel-Cokato in the Section 3A title game. Burgau allowed just one goal in three section tournament games, posting a .033 goals-against average and .978 save percentage. His regular season numbers (2.06 goals-against average, .916 save percentage) although not as spectacular, also were impressive. The 6-foot Burgau is a big presence in the net and in the locker room. He also serves as a co-captain. New Ulm's roster is dotted with players who return from that humbling loss to Breck. Setterholm recently replayed video of that loss, although his editing was selective. The Mustangs' amazing four-goal outburst didn't make the final cut. “We didn't want to watch anything but the first period,” Setterholm said. “We didn't hardly have a forecheck going in that game. We're going to have to try to get out and come after (St. Thomas Academy). That's not a foreign concept for the Eagles. 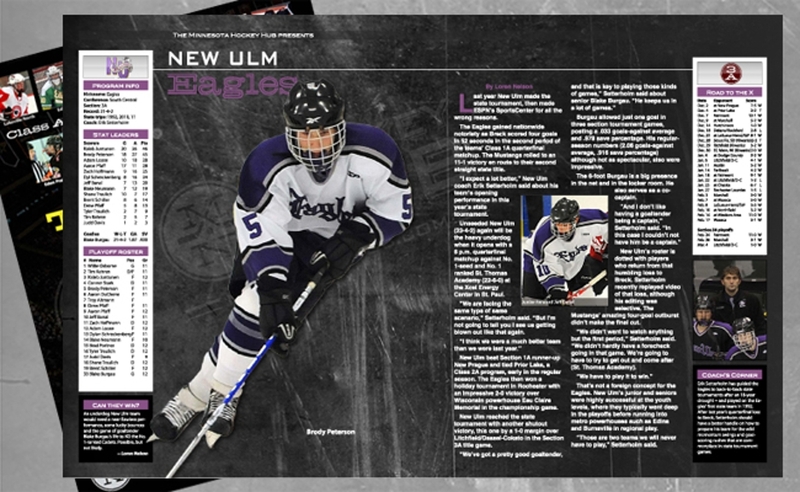 New Ulm's junior and seniors were highly successful at the youth levels, where they typically went deep in the playoffs before running into metro powerhouses such as Edina and Burnsville in regional play. “Those are two teams we will never have to play,” Setterholm said. An underdog New Ulm team would need a near flawless performance, some lucky bounces and the game of goaltender Blake Burgau’s life to KO the No. 1-ranked Cadets. Possible, but not likely. Erik Setterholm has guided the Eagles to back-to-back state tournaments after an 18-year drought -- and played on the Eagles’ first state team in 1992. 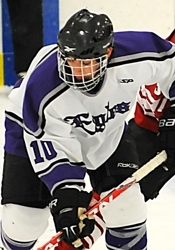 After last year’s quarterfinal loss to Breck, Setterholm should have a better handle on how to prepare his team for the wild momentum swings and goalscoring rushes that are commonplace in state tournament games.